The perfect wine glass! Stemless Pinot Noir wine glasses are all the rage and these beautiful wine glasses are just what you're looking for. Shaped to enhance your wines' flavors, they're mouth-blown of fine quality lead-free glass and because they're stemless, they fit easily in your cabinets and dishwasher. A perfect choice for casual entertaining and everyday enjoyment. Is this set of eight glasses Riedel glasses? BEST ANSWER: No,but I like them much better because they are much more sturdy and durable. Riedel glasses break much easier They are more eensive as well. No, but we like them very much. They are our go to wine glasses. 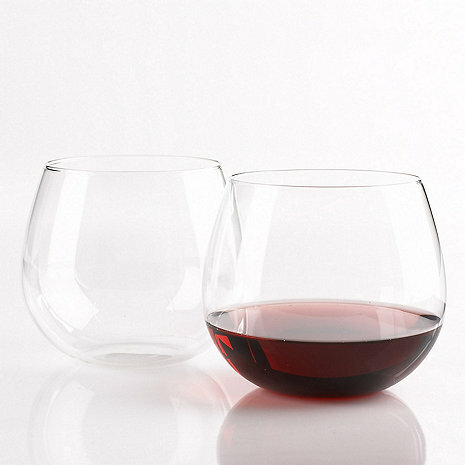 These stemless Pinot glasses have such a cool shape - they are large, so for small handed people you might need two hands! They are distinctive on our wine glass shelving - love them. I like these wine glasses very much except for one feature. The y bellow out where most people would hold them and the flair is very wide. Many people would not be able to stretch their fingers that wide. The appearance of the product is good. A smaller flair would be better.